Walking two dogs at once is no more a tedious task! 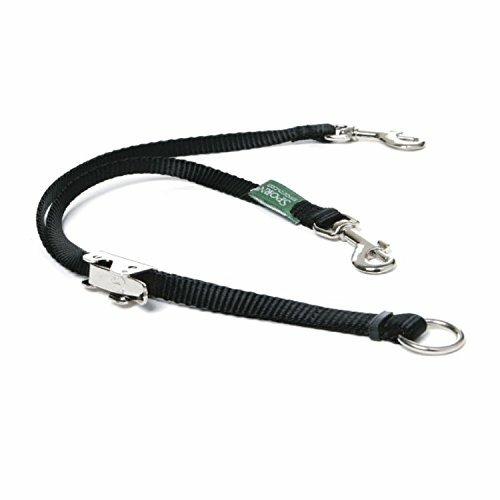 The Sporn Double-Dog Coupler allows you to use a single leash to walk two dogs. You have the option of walking two dogs of different sizes, breeds and heights without any fuss. Keep them close together or far apart. Perfect for professional pet walkers, trainers, lovers or people having two dogs. Just attach your own leash and go! The Sporn Company are pioneers and industry leaders in humane dog control walking solutions technology. Collectively our team has over 100 years of experience working with dogs. We are so positive that our products can enhance you and your pet’s walk time together that we offer a Lifetime Guarantee on all our couplers. We even guarantee you will be able to walk two dogs at once comfortably, without any fuss. The Standard size (MEDIUM THROUGH LARGE) HAS 5/8 inch wide NYLON WEBBING. Ideal for dogs weighing over 15 pounds, such as Labs, Setters, Australian Shepards, Boxers, Setters, Medium to Larger Terriers, Golden Retrievers and other medium large size dog breeds. Warning: Recommended for walking purposes only. Do not leave the coupler on dog unattended. Not to be used as a tie-out. If you have any questions about this product by Sporn, contact us by completing and submitting the form below. If you are looking for a specif part number, please include it with your message.